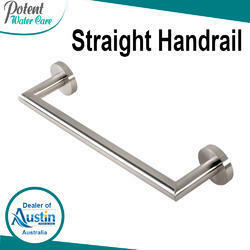 Polished handrails steel AISI-316 or AISI-304 in length 1 M.
Safeguard people from slips, falls and more. From the time we have established ourselves in this business compilation, we have come up with a top class collection of Design Handrails. All handrail and support fixtures shown are in polished stainless steel 43 mm pipe. We offer these ready made artistic handrails which are railings used on stairways to provide guidance. These are aesthetically designed from wood with intricate carvings and engravings.